On February 1, 2018, officers from the San Luis Police Department responded to shots fired at the intersection of Cesar Chavez Street and C Street in San Luis, Arizona. Upon officers arrival they met with several witnesses that mentioned that a verbal argument took place, and that a male suspect wearing a dark hooded sweater shot at the victim four time with a handgun. Witnesses reported that the suspect that fired the shots left in an unknown dark in color sedan as the passenger. Officers made contact with the male victim, who was struck by one of the bullets on his leg. The victim was taken by ambulance to the hospital, and he was later released with no life threatening injuries. The San Luis Police Department is asking for the public assistance in obtaining any additional information regarding this incident, which may lead to the identification and apprehension of possible suspect(s). 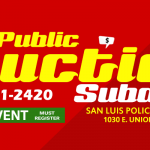 Anyone with additional information is urged to call San Luis Police Department Detective Lara at 928-341-2420.